Before the Mitchell Corn Palace, there was the Plankinton Grain Palace. The idea of a grain palace was not a new one. In the late 19th century, a number of cities on the Great Plains constructed crop palaces to promote their community and encourage people to settle in the area. A grain palace “is a peculiarly apt and happy expression of an appreciation of nature’s bounty. The community that has material for a lavish grain palace has the inherent qualities of soil and climate which assure prosperity,” stated the Wessington Springs Herald on Oct. 9, 1891. South Dakota newspapers in 1891 reported harvests of oats from 50 to 100 bushels per acre, 30 bushels of wheat to the acre and corn stalks measuring 11 feet high. A train load of businessmen from Sioux City, Iowa, attended the inaugural ceremonies for the Plankinton grain palace on Sept. 29, 1891. 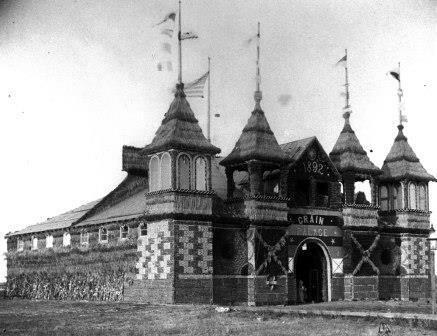 Sioux City had its first corn palace festival in 1887, with one newspaper stating that interest in the corn palace increased each year. The Plankinton grain palace was 80 feet square and sat on the north end of Main Street, according to “Palaces on the Prairie” by Rod Evans. Residents of White Lake assisted in the building’s construction. Grain was transformed into works of art depicting an elk, a flock of sheep in a field, and a farm house. About 200 Mitchell residents took the train to Plankinton to visit the grain palace. A band played as the train pulled into Plankinton, and a parade of visitors and residents passed up Main Street to the palace. “The palace is indeed a marvel and every visitor was agreeably surprised. The people of Plankinton are to be congratulated on their enterprise in producing such an artistic and attractive exposition of the magnificent crops,” stated the Oct. 9, 1891, Mitchell Capital. The grain palace was ultimately bought by a farmer, according to an account in one newspaper. Another palace was built the next fall. In the center of the building was a fountain. About 1,000 people were reported to attend the opening day on Sept. 28, 1892. The grain palace remained open until Oct. 8. The three main political parties of the day – Republican, Democratic and People’s Party – each had a designated day for orators. Days were also designated for Sioux City residents, farmers, traveling men and education. That same year though, a Corn Belt Exposition was organized in Mitchell and a corn palace was built in that city. About 500 Plankinton residents took the train to visit Mitchell’s corn palace, and an equal number came to Plankinton by train from Mitchell to visit the grain palace. The summer of 1893 brought news that Aberdeen was also constructing a grain palace, and the first exposition took place in September. That competition, along with corn palaces in Sioux City and Mitchell, might have proven too much for Plankinton. The 1892 grain palace was its last. Ipswich, Gregory, Timber Lake, Rapid City and Saint Francis built crop palaces between 1909 and 1932, according to Evans. But the only palace that lives on as a grain palace is the one in Mitchell – the World’s Only Corn Palace.